Over 200 different species of sharks are found in South African waters. Populations of many species are considered reasonably healthy, in relative terms to the rest of the world’s fast dwindling populations. But developed nations are facing depleted shark stocks in their own countries and the all time high demand for shark fins is forcing these foreign traders to increasingly turn their attention to the southern seas. Africa, whose marine environment is frequently neglected, is a prime target. Many developing countries do not have the political power or resources to police against pirating, and some developing countries are involved with a view of short economic gain. In other regions piracy is overlooked because of mutual political back scratching between countries. In South Africa, lack of adequate management policies and ineffective compliance is resulting in unsustainable fishing practices, while inadequate enforcement within South Africa’s EEZ results in perpetuated poaching and over-harvesting of all its resources, including sharks. As fish stocks decline local fishers are turning to finning sharks, despite the country banning this barbaric practice. Clearly no shark is safe from overexploitation as human population grows and resources worldwide decrease. In addition to being directly targeted in various commercial and recreational fisheries in South Africa, millions of sharks are captured incidentally as bycatch by our tuna and swordfish longline fishery every year. Overall South Africa lacks shark conservation and shark fishery management policies and to date is yet to implement the National Plan of Action (NPOA) drafted in 2000. 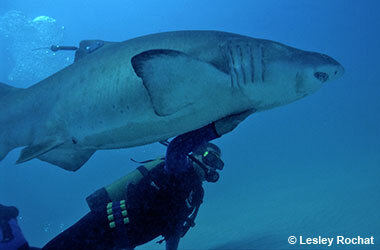 The document provides the guidelines for the management and conservation of South Africa’s sharks, and is since coined the National Plan of InAction by conservation groups. The NPOA was recommended by the FAO as an urgent measure to address the drastic decline of shark populations worldwide. Another threat to South Africa’s fish and shark stocks is the increase of foreign vessels being allowed to fish in South African waters. Masanori Miyahara, Chief Counselor of the Fisheries Agency of Japan, says he is looking to increase the current number of around eight Japanese vessels fishing in joint ventures with South African tuna and swordfish permit holders, which also catch many sharks. “South Africa is an important partner for Japan and we hope to increase our relationship because South Africa’s tuna grounds are very good in the 200 mile zone. The tuna species caught in Cape waters fetches the highest price of its kind in our markets,” said Miyahara. Against this background we are focusing on a suite of charismatic shark species which we feel confident we can gain improve protection for, and which currently have either very limited or no protection at all. Though scientific research is lacking for all these species, they are of very high eco-tourist value and responsible for South Africa being recognized as a shark diving Mecca of the world. Every year thousands of tourists come to South Africa to have a unique diving experience with some of the oceans top predators. This eco-tourist industry brings in millions of Rands of revenue annually, and provides job opportunities to a country with a high unemployment rate. Sharks most frequently viewed are White Sharks, Tiger Sharks, Raggedtooth Sharks, Bull Sharks, Blacktip Sharks, Bronze Whaler Sharks (prime species of the Sardine Run), Hammerhead Sharks, Whale Sharks, and Cow sharks.